It seems human nature that when asked to put on an event, meeting, or fundraiser, that our first instinct is ‘how hard could it be?’ We’ve all planned birthdays and traversed family get-togethers, and perhaps this is what lures us into a false sense of security. Then, when we’re standing in a room too small, with food no one can eat because of allergies the y didn’t tell you about, and an insufficient sound system that sounded just fine when you tested it at home, you start to think it might not have been worth the stress. Of course, some people are very good at throwing the perfect event at the right price, and a lot of them are seasoned Event Consultants. They exist to make your life a whole lot easier! So, unless you’re like this kid to the right…Here are a few things to consider before you decide to go it alone. Event Consults know how to work a budget. Something that tends to turn people off is the expected price of hiring a consultant. 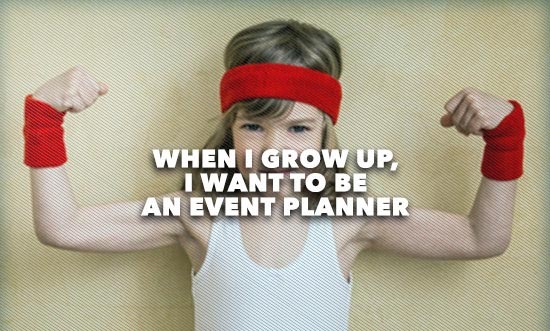 But a big part of working in events is knowing how to work within the client’s budget. Not to mention they will have friends in all the right places, and will know how to get some great deals out of them. Do you thrive on stress? Why waste time and energy worrying if the caterer is going to show up on time when you can have someone do if for you? Odds are when a big event rolls around you already have your hands full just making sure you and yours get ready. Having someone else there, who has been there before and liked it enough to make it their job, can leave you open to actually enjoy the experience. Do all the themes you come up with sound like you’re planning a high school dance? If you’re actually planning a HS dance, then great! But if not, then you might want to consider some assistance. Some events require elegance, some are strictly business, and some are a little more on the fun side. A trained consultant not only knows how to work with your vision in mind, but they can help you create a vision to have in mind. From table cloths to location and lighting, they know what works best and can help your event look just the way you envisioned it. Planning an event requires attention to details, and more often than not, a detail or two gets overlooked. Maybe it’s that extra decoration for the tables, or perhaps you didn’t realize there wasn’t enough parking. Consultants are literally being paid to remember these kinds of things. Trained consultants don’t just know how to throw a great party, they know how to get people to come. If you’re looking to have a fundraiser you want to make sure the word gets out to the right people and an Events Consultant will know how to find them AND help manage the guest list with ease. If all of this sounds good to you remember it doesn’t hurt to ask. Get in touch with a consulting company and see if they’ll be a good fit for you. Many, like BluElefante, are even on Facebook, making it easy to communicate and get your questions answered quickly.